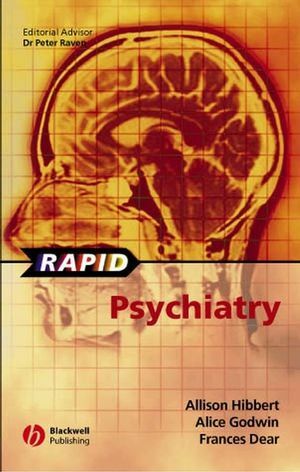 Rapid Psychiatry covers the common psychiatric conditions encountered on the wards, in clinics, in general practice, and in exams. It acts as a rapid refresher, and is a concise no-nonsense book covering just the basic relevant facts. The book is divided into sections covering psychiatric history-taking and examination, differential diagnosis, disorders, treatment, the key points of the Mental Health Act, psychiatric emergencies, and a glossary of terms. The disorders are arranged in A-Z format, and each topic is covered using the same Rapid series mnemonic that covers Definition, Aetiology, Associations/Risk Factors, Epidemiology, History, Examination, Pathology, Investigations, Management, Complications, Prognosis and Differential Diagnosis. Section 1: Psychiatric History and Mental State Examination. Assessment of an eating disorder. The patient with obsessions and compulsions. The thin patient, the patient who overeats. Section 3: Adult Psychiatric Disorders. Section 4: Child psychiatric disorders. CPA and the multidisciplinary team. Serious adverse effects of drugs. The patient not eating or drinking. The patient who has taken an overdose. Suicidal Patient/ Deliberate Self Harm. The violent and abusive patient. 3. Forensic Psychiatry and the Mental Health Act. 4. List of psychiatric emergencies. 5. Physical disorders with psychological consequences.